Now that the cat’s out of the bag about one of my major distractions this month, let’s see if I can hit 50K words despite that, not use it as an excuse to fall short. Hoo-RAH! On the other hand, just once I would like to hit my target word count for the day about 19:30 or 20:00 in the evening and get to bed on time, instead of frantically posting whatever pathetic fraction of my word count I’ve got so far at 23:55. Or 23:59:59.99. Tonight, words are hard, like pulling teeth. I seem to have the attention span of a box of kittens. Yet slowly, stubbornly, I have dragged out a few hundred words. Maybe my muse went out partying and drinking to celebrate the new job, leaving me here to wallow semi-aimlessly. I hate it when she does that. 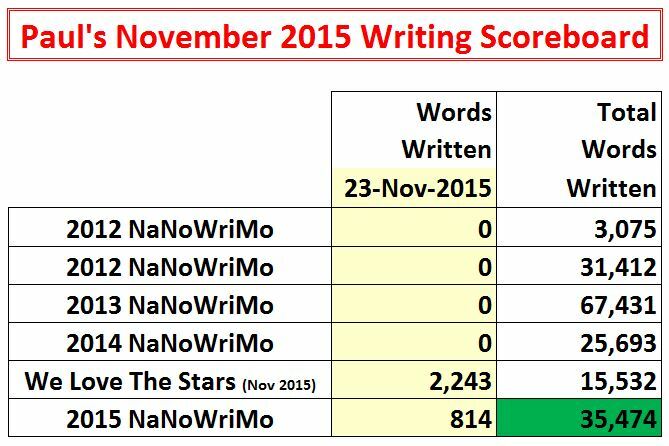 While I normally put in a lot of internal links to previous, related posts here, I won’t be doing that for what I hope will be this year’s thirty NaNoWriMo posts. If you have jumped into or stumbled onto this story in mid-adventure, there are plenty of other ways to navigate around the site to find previous installments. Actually doing so is left as an exercise to the student. Nothing moved except for the constantly shifting waves from horizon to horizon. This far out from any island or coastline the sea birds were few and far between. A few clouds drifted overhead in waves, spinning off from a cyclone far to the south. A particularly large group of thunderheads was building far on the eastern horizon, an indication of Tebuaeran’s presence there to those who knew how to read the signs. No ships traveled these waters regularly. Only marine research vessels had any interest in the area, and most of their work had been replaced by autonomous drone ships. Far off of the highways laid out in the sky, no intercontinental aircraft passed overhead. Today the seas were calm, the waves less than five feet tall, the whitecaps nothing but thin tips on the wave tops, pushed over by the breeze. There would be days when a typhoon could raise those waves to ten times that size, leaving them to crash down with millions of tons of force, where there was almost nothing except other waves to impact. Today was not one of those days. Riding just barely above the level of the waves, Hydrological Data Collection Buoy 319 was nearly invisible. Only a thin whip antenna stretched far above the surface, oscillating as the buoy bobbed up and down, back and forth. The top of the buoy body was covered in solar cells to keep it alive. Below the SUV-sized instrument and electronics vessel, the skeleton of the buoy stretched down almost fifty feet, where it attached to the carbon monofilament line, which in turn connected to the anchor thousands of feet below. The skeleton was studded with various instruments, including an array of microphones. The incredibly sensitive microphones listened carefully for the soft sounds of submarines sliding through the deep, the far off songs of whales singing incomprehensible ballads, and the telltale, subsonic, deep base tones of underwater earthquakes or landslides that could cause a deadly tsunami. Surprisingly, this buoy also had an underwater speaker. Listening vigilantly through day and night, oblivious to weather, the scorching tropical sun, or the stunning beauty of the Milky Way spanning the sky at night with no lights for hundreds of miles to interfere with the view, HDC Buoy 319 faithfully sent its data up to one of the many satellites passing overhead. Now, something different was happening. The buoy microphones began to hear a distant series of whistles and clicks. Faint at first, the sounds could be heard to repeat every few minutes, gradually growing closer. Soon they were quite distinct, if unintelligible to all of the military and scientific monitoring bots which sampled the data coming down from HDC Buoy 319 as well as hundreds of others. The pod of dolphins which approached were moving at top speed, their powerful tails pushing them at over twenty miles an hour. The casual observer might note that the pod was traveling straight as an arrow toward an area near HDC Buoy 319 with no breaks to rest. It might be noted that the various dolphins took turns swimming in the lead, with the others drafting behind them much as a runner or bicyclist in a race might. It probably would not have been noticed that one of the dolphins never took a turn in front, was always surrounded by other dolphins, and was the source of the repeated cries for attention. As they approached the buoy, the volume level of the repeated cry reached a predetermined threshold. While almost all of the monitoring bots continued to ignore the noise from the dolphins, one bot activated and began to pass the audio feed on to another computer, which passed it to another, and to another. A top secret, almost unique subroutine began running, interpreting the dolphin cries. In seconds, a signal was returning back out through the chain of computers and satellites, causing the speaker on HDC Buoy 319 to begin pinging loudly. The primary dolphin ceased his cries as the dolphins responded by altering their course just slightly, heading straight for the signal. An hour later most of the dolphins were swimming in guard patrols through the area around and below the buoy, while the one dolphin hovered near the buoy and began to talk to it.